Hi! My name is Oreo an’ me an’ my bro, Brownie, get to try this blog thingy out today. First, I’ll tell ya a lil ’bout us. See me an’ Brownie came from the same doggy parents an’ this real nice human had us for ’bout 2 years. He had to move, an’ tried really, really hard to find a place to live where we could live to, but he couldn’t, so he ended up bringin’ us here. We were kinda scared when we first got here, Brownie more than me, but after gettin’ used to all the noise an’ commotion, an’ goin’s on, we started settlin’ in. Even though we’d really love to go to a forever home together, we don’t have to… even tho we’d miss each other, we’ll be okay. Maybe if we don’t get adopted together, our new humans will wanna stay in touch so we can still hang out an’ play together. Anyways, I got kinda sidetracked. So, here’s what ya need to know… we’re both Pit Bulls, we’re 2 years old, an’ pretty good with most other dogs. I’m a lil more picky than Brownie, but maybe it’s ’cause I got a bit more energy than he does! We love humans!!! We both love givin’ kisses, an’ goin’ for walks (I heard from some of the other dogs here that if you jump the fence, you getta go on more walks… so I figured out how to jump the fence, tee hee. The dogs who don’t jump fences get to go on walks, too, but they also get to spend time hangin’ out in the yards longer, in case you were wondering ’bout that). We both walk pretty good on a leash, an’ are good with adult humans, an’ small humans, or kids, I think. I would love to chase cats, but our humans won’t let me, an’ I guess I understand that ’cause our humans love all the cats an’ dogs here ’cause they’re awesome like that. That’s enough ’bout me, I’m gonna let Brownie have a turn now. Hi… I’m Brownie. Oreo is a bit more outgoing than I am, not that I’m really shy or anything, but I’m not as outgoing as she is. I love goin’ on walks, too, and LOVE givin’ kisses! I went to a fundraiser at Gordon Biersch earlier this month, and one of the volunteers there said that I was a real flirt and a charmer… I’m not quite sure what all that means, I was just being myself and giving her lots and lots of kisses! Oreo and I wanted to kinda tell you what we’re like, and the kind of forever home we’d like because there’s another satellite adoption event on Friday. It’s at Tail Waggin’ PetStop from 6-8 p.m. May 1st for something called “First Fridays”. I don’t know if I’m going yet or not, but I know last month Farley went, and this really, really nice human who spent a lot of time with him thought he might be a good match for her and her dog. 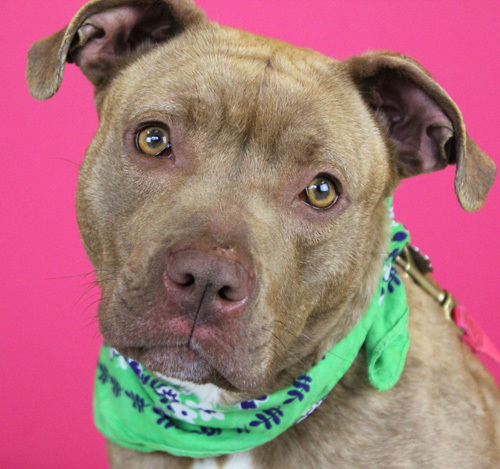 After Christine talked with her, Bruno ended up being perfect for her and he went to his forever home on Saturday… so we’re hopeful maybe someone will want to meet us! I’ve been to a couple satellites and am real well behaved. I’m good with both big and small humans, and most dogs. I can handle my sister’s energy, and if I can’t go to a home with her, would really love to have a doggy brother or sister. I’ve been “cat tested” and behaved, but our humans would say that I should really be supervised if I were to go to a home with cats. Both of us keep clean kennels, so we wouldn’t be hard to house-train… we’d just have to learn the routine in our new home. That’s a good reason to adopt an adult dog versus a puppy, just sayin’, ’cause we’re grown up an’ know house rules, like what not to do in a home. Well, that’s all from me for now… bye! Hey, how ya’ll doin? I love all dis nice weather we’re havin’ an’ I’m enjoyin’ all da sunshine! 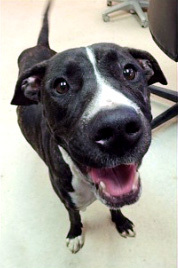 I wanted ta blog today ‘cuz I saw dat Rylee found a forever home, so I wanna tawk ’bout the kinda forever home I’d like… an’ I know some oder dogs are goin’ to a satellite an’ fundraiser thing later today at Gordon Biersch, an’ even tho I’m not goin’ ya never know who might be lookin’ to adopt a dog like me! First, lemme tawk ’bout all ma good qualities, an’ I gotta few. See, I’m real friendly with humans, I love hangin’ out with ya’ll an’ gettin’ treats, pets, an’ goin on walks. I walk nice, like I don’t pull da human who’s walkin’ me too much. I like playin’ fetch in da yard wit rope toys, an’ when I’m relaxin’ inside after a walk, I love stuffed toys cuz I like to find da thingy in dem dat squeaks an’ pull it out! I’ve been to some obedience classes at dis place called “The Dogs’ Spot” wit’ a volunteer, Stan, an’ I’m learnin’ lots an’ lots ah new stuff. I know how ta “sit”, “watch me”, “down”, an’ I’m workin’ on “stays”… dey’re kinda borin’ but Stan gives me really dee-li-cious treats when I stay like he asks me to! An’ he gives me lots ah praise, too! I’m real good in da yard, too, cuz I don’t jump da fence here. I got more stuff to do dan botherin’ wit jumpin’ the fence! I’d really, really like to be the only pet in da home. 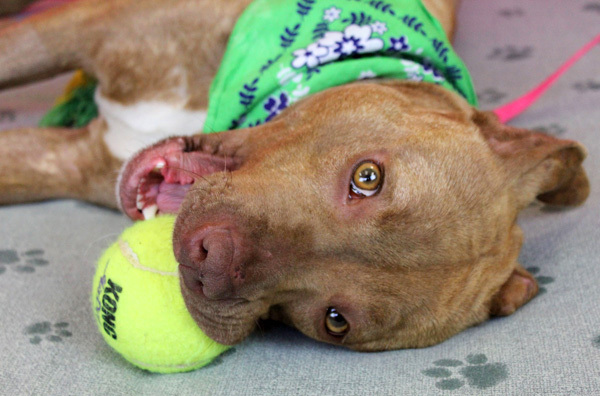 I gots lots an’ lots to offer, like unconditional love, nice kisses, an’ just chillin’ wit my new family. I don’t really wanna share any attention wit anoder dog, an’ I wanna just chase cats, which I know ya’ll don’t like so much, but I’m a dog, it’s what we do (I think dere’s somethin’ a lil strange ’bout dogs who like cats, it ain’t normal, but dats a whole ‘nother story). I’d be real good with small humans, but not too small cuz I’m still workin’ on learnin’ somethin’ called “manners”… meanin’ when I get real happy an’ excited I jump up an’ I’m workin’ on learnin’ not ta do dat, but it’s hard! Well ya’ll, dat’s all I got for now! 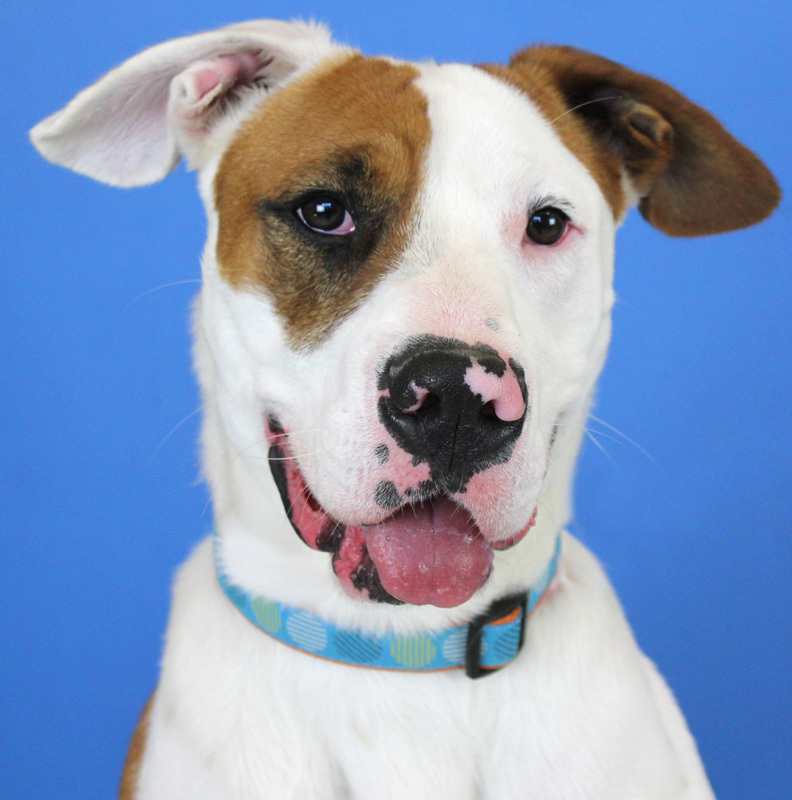 If ya don’t got anythin’ planned for too-naght, go to da fundraiser at Gordon Biersch to support HSGKC, an’ meet a few of da oder dogs lookin’ for forever homes, too. If ya wanna learn more ’bout me or how ta adopt me, go to hsgkc.org or ma Petfinder page! I hope all ya’ll have a real nice day! 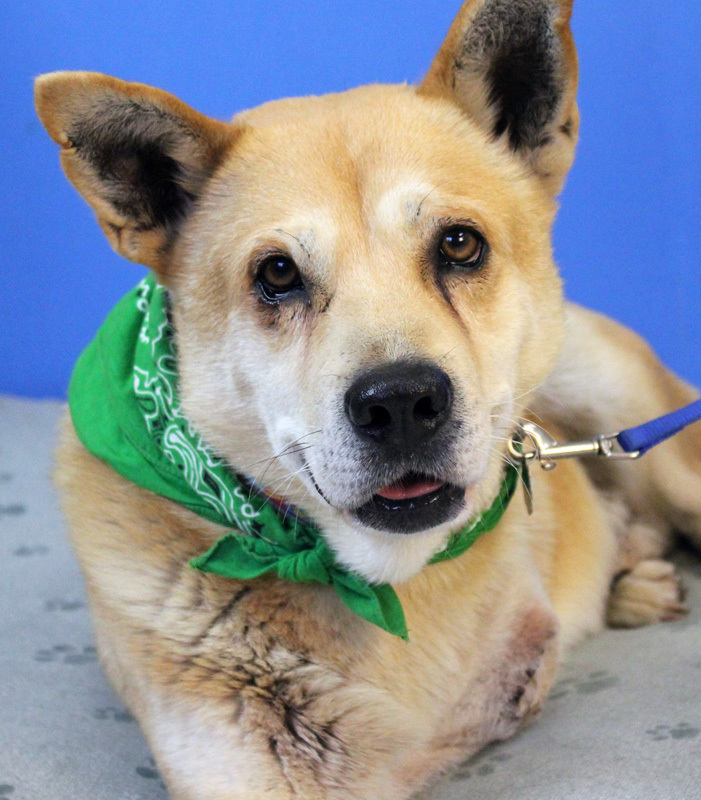 Hi, my name is Luke and I’m an 8 year old Chow Chow/Shepherd mix. 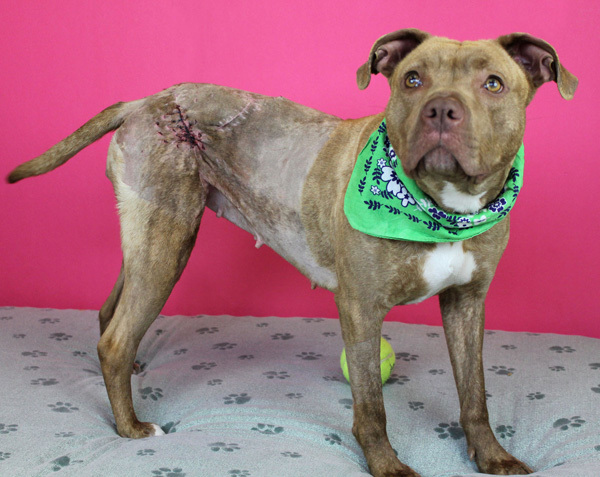 I came to HSGKC back in December ’cause I was picked up by KCK Animal Control with a real bad front leg… it was broken, and I was in a lot of pain and it couldn’t be fixed, so I had to have it amputated (ask anyone who knows me, and they’ll tell you I get around just fine on 3 legs… us dogs and cats figure out real quick how to manage on 3 legs!) And, as if that wasn’t bad enough, I also was heartworm positive! Our people here took really, really good care of me and I’m all healthy now. I was even pictured on a front page article of the Kansas City Star with Gia a couple of months ago. I gotta tell you though, heartworm treatment is rough! I’m real glad that’s over with and that I can run around the yard off leash again! The reason I get to blog today is ’cause tomorrow I’m gonna go to a fundraising event at Gordon Biersch in Leawood, KS, from 5:30-8:30pm! They’re doin’ somethin’ called a Maibock Tapping Party to help raise money for us dogs and cats HSGKC takes care of. I have absoblutely NO idea what Maibock is or a “tapping party” but I guess it’s somethin’ humans like. I’ve heard of some yummy beer that’s made just for dogs… I wonder if they’ll have any of that there for us, that’d be cool! I like going to events ’cause it’s fun to meet new people, get lots and lots of attention, and just get out and about! 4 other dogs will be there, too, Hazel, Holly, Charlie, and Farley (sigh, he’s a nice dog… but he’s kinda like a pesky younger brother to me). I’ll get a lot of attention though because for some reason, people seem to really feel sorry for me ’cause I only have 3 legs. If you want more info about the event tomorrow, go to www.hsgkc.org. I wanna tell you a little more about me, too, like about the kinda forever home I’d like. I’m a mild mannered guy, pretty chill, and would do fine living with other dogs as long as they’re mellow and mild mannered like me. Puppies are okay, but not really my speed. I’m good with people and kids… ’cause I’m cool like that, and affectionate. I like being brushed, and I walk nicely on a leash, too. However, I am not allowed to live with cats per our humans because I like to chase them! That’s the only time I give the human walking me a hard time is when I see a cat. Other than that one little thing, I’m a pretty awesome guy. I keep a clean kennel, and am good about “kenneling up” when I’m asked to. A fenced yard would be nice, but I don’t have to have one as long as I’m always walked on a leash (you know, ’cause I wanna chase cats… which is so much fun but I know people would prefer I don’t do that… some people are “cat people”, and I suppose it’s not very nice even though it’s fun). I don’t bark a whole lot either, so I’d be okay in an apartment or condo. I’m gonna go for now, but I hope to see you tomorrow night! Don’t forget, if you wanna learn more about me check me out on HSGKC’s website. Peace out! Hi everyone, my name is Pibble. I’m 2-3 years old and I’m a Pit Bull. I getta try this blog thingy out today ’cause I getta talk ’bout me an’ Skinny Pete. The reason I wanted to blog is ’cause I know Jai (she’s one of the humans who takes care of us, specifically me and Skinny Pete) has put some stuff ’bout us on somethin’ called “instagram” and I thought you might wanna know how we’re doin’. Before I say too much more… I want to tell you I’m doin’ great! You may have read about my bad injury or seen photos of my injury on Instagram or Facebook, but I want you to know that thanks to the surgeries and lots of TLC from the humans here I’m getting better everyday! Skinny Pete was shot in the foot, and he’s doin’ fine now, too! This is my buddy, Skinny Pete! I learned that ’cause HSGKC works with KCK Animal Control, dogs and cats who need extra medical attention come here ’cause they have more humans here to do the stuff we need, and that’s how Skinny Pete and I came here. Anyways, we’re doin’ really good! I think Skinny Pete has a lil crush one me, and I gotta be honest, I have a crush on him, too. We LOVE playing together, and hanging out together in the volunteer room. We wrestle, and run around, and make our humans laugh. I think the reason our humans love us so much is ’cause we have real good temperaments… like we LOVE all the humans we meet, especially when they give me Pup-Peroni (Christine found out that’s my most favorite treat, so she always have a stash for me). They also love us ’cause despite what’s happened to us, we are happy and love humans. I’m also great with cats, too. I’m gonna go for now, but before I do, I just wanted to say I’m sooooo happy HSGKC helps dogs like me and Skinny Pete! We’re so lucky to be here, and we’re doin’ great! If you’ve made a donation to help us, thanks! Next time I’ll talk about the kinda forever home I’d like. If you wanna learn more about me, Skinny Pete, or how to help HSGKC, check out the HSGKC website, or you can make a donation to Gabriel’s Fund or Ray of Hope in our name. My wound is almost healed now! Thank you to everyone who’s helped me get better!